Concrete is a construction material that is sufficiently strong in compression, but weak in tension. Hence, concrete is reinforced with steel, because it has good tensile strength and bond between steel and concrete is also good. The steel bars that are incorporated/reinforced in concrete to impart tensile strength into concrete are known as steel rebars. Rebar is reinforcing bar. 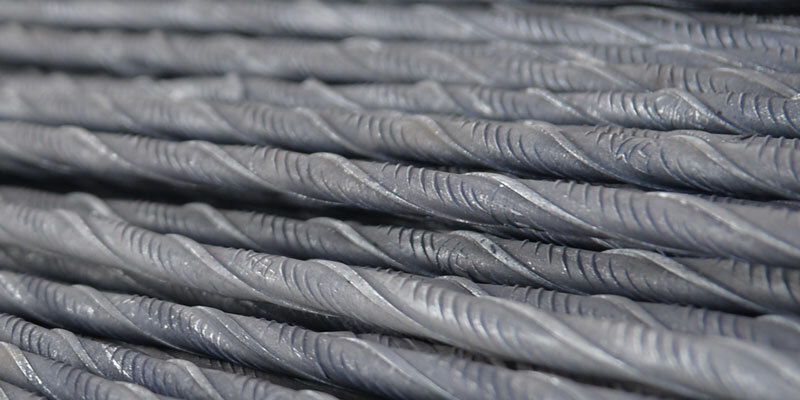 Steel bars are used as rebars because elongation of steel due to high temperatures (thermal expansion coefficient) nearly equals to that of concrete. It Should conform to IS 432 Part I specifications in India. These steel rebars are plain in surface and round sections. Easy to cut and bend. Should conform to IS 1786 specifications. These are HYSD (High Yield Strength Deformed bars) bars having lugs, ribs or deformation on their surface, reducing slippage in concrete and increasing the bonding between concrete and steel. Deformed Steel bars have better properties than plain steel bars. The bars are twisted single or double i.e. two bars twisted together spirally against each other. The stresses developed during twisting, increases the yield stress of bars. In Fe – 500D, D stands for Ductility. These bars are more ductile than Fe – 500. Rebars are supplied in U-bent or straight rods of 40ft in length. Most commonly used rebar these days is TMT bar. TMT process changes the structure of material to a composite structure with tough surface rim and soft (ductile here) core providing an optimum combination of high strength, ductility and bendability. TMT saves steel consumption as well as cost. If a structure has 1000 tons of M.S reinforcement than using TMT bars reduces the steel consumption to 400 tons saving 600 tons of steel with no compromise in the strength of structure. Reduction in steel reduces the considerable cost of structure.